Q: How do I shop for products? Q: How do I see more details on a product? Q: How do I request a product deal? Q: When will I get chosen for a product deal? Q: How do I view all of my requests? Q: How do I remove my request before being approved? Q: How do I accept or decline a voucher after I have been approved? Getting started with shopping for deals on Vipon is easy. You can start by just browsing the products listed on the homepage! A better way to shop for products is to take advantage of the search filters. Here's a quick guide to using these tools (please refer to the screenshot as well):Search bar. Enter in your search terms to view products with matching terms in their descriptions. If you get too many result, narrow your search term. If you don't get enough results, widen your search term. Location filter. Select the Amazon page associated with your country to view only the products that are available in your country. The Vipon site will show products from the US by default. 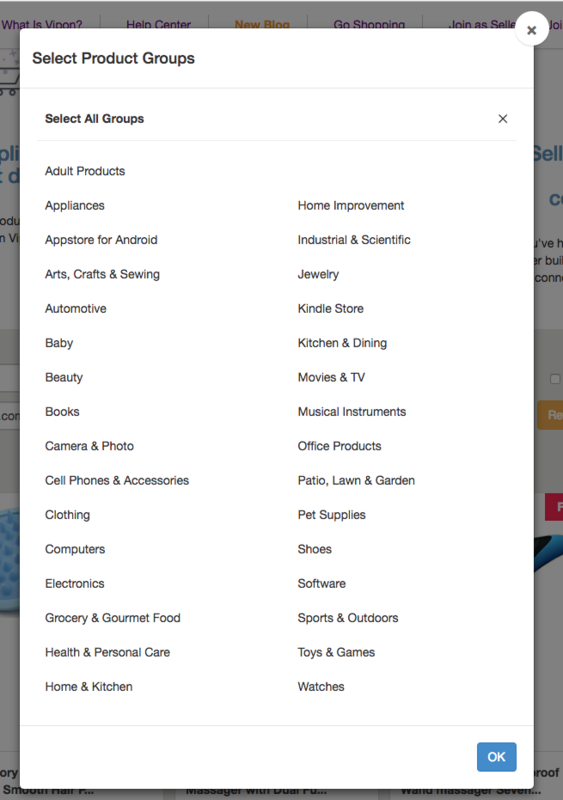 Click on the arrow to show the full list of Amazon marketplaces. Category filter. There are dozens of categories to select from. Make a selection here to view only products that fall into that category on Amazon. This search function isn't perfectly aligned with Amazon as we don't have all of the sub categories within Vipon. So if you can't see the result you want, just leave it as the default 'All Product Groups'. Sort feature. There are options here to sort products by expiry date or price. The default setting is Sort by expiry ascending (soonest). Sort by Price highest first or lowest first. Best Discounts. Check this box to view products which are less than $5 or have a discount greater than 80%. Once you've put in your search settings, click the orange "Refresh/Search" button to view the products that match! Didn't find what you're looking for? Try changing the search options and go again. To see more details on a product, including more information on pricing and a product description, you can simply click on the product image or title. This will open a pop-up window with more details. Q: How do I request a deal? To request a product deal, click on the blue button that says "Request Deal". This will let the seller know that you want to purchase the product at the discounted rate. Note: if you haven't created a Vipon account yet, you will need to do this before your request is received by the seller. You will not automatically be approved for every product deal you apply for. The seller will decide if you are a good fit for their product. They will either approve or decline your deal request. You will be able to see if you have been selected in your Vipon dashboard. You can review your requests at any time by clicking on the "Deal Requests" link on the top right of the page. Please do not apply for deals on too many products. Only request products that you are ready and willing to purchase. Click on the "Deal Requests" link on the top right of the page. Find the product in your list of requested products. If you haven't yet been approved for a product deal, it will say "Pending" in the Status column. To remove your request, click on the green "Remove Request" button in the far-right column. After you have been approved for a product the status column will show as "Approved" however you still have the option to accept or decline the voucher. Most of the time you will press “Accept Voucher”, then you will receive the code and it will be shown in this section. However if you decide you no longer want this product or voucher, you can press “Decline Voucher”, you will not receive the code and this will remove the request from your dashboard. Note: You will have 3 days to make a decision on whether to accept the voucher, after accepting you will have 2 days to complete the purchase.